This is the journal article from which the proceeding information, figures, tables, and references were gathered. Please follow the citation in order to access the full article. The following is a summary. It allows farmers the possibility to have more control over the process, and the potential to positively alter the quality and flavour of their cocoa beans. The more they understand impact of pod storage on cocoa bean flavour, the more farmers can use this as a tool to their advantage. If their cacao is more desirable (improved flavour), they may be able to sell it at a higher price to those makers looking for fine flavour cocoa. The best part is that pod storage is a practise that has little or no extra cost to it, which is an important factor for tools available to cacao farmers. For those makers who work closely with farmers, understanding how pod storage works can help them to educate the farmers and help them improve the quality of their seeds. In doing so, the makers will be able to obtain higher quality seeds and also be willing to offer more compensation to the farmers. Other than understanding what happens to your chocolate behind the scenes, understanding pod storage may help in interpreting marketing you may come in contact with in the future. Many chocolate makers add industry jargon that sounds cachet in order to push their product and make it seem trendy, important, or of higher quality. Although pod storage isn’t one of these trendy terms, it may be in the future, and it’s important to know if it really does have an impact on the flavour, quality, and cost of your chocolate bar. A technique used in some countries to improve the flavour of their cacao seeds. When cacao pods are harvested, they are often opened soon after. The seeds and fruit inside the pod are removed and sent off to be fermented. However, some farmers purposely do not open the pods soon after harvest, and instead allow the seeds and fruit to sit inside the intact pod for a few days to a week. It appears to first be used in Malaysia as a way to decrease the levels of acidity in their cacao. Acidity generally isn’t favorable in chocolate products, and so the farmers and chocolate makers use techniques that will reduce the high levels of acidity in cacao and chocolate. 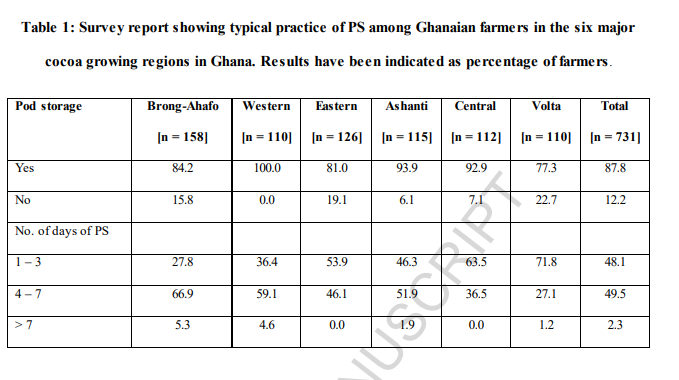 731 farmers were interviewed, from 6 major cacao growing regions in Ghana. They were asked questions regarding their farms, farming management, if they stored their pods, and if so, for how long. In Ghana, Close to 90% of farmers store their pods. Of those who store their pods, about 50% store them up to 3 days and 50% up to 7 days. This difference appears to be regional. 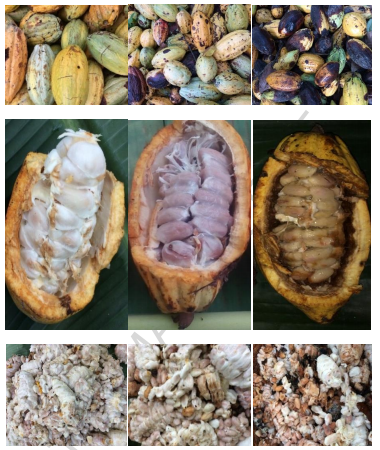 In this paper, the researchers analyzed the composition of the cacao seeds that were opened on the day of harvest (0 PS), on day 3 of pod storage (3 PS), and on day 7 of pod storage (7 PS). A major risk of pod storage is senescence, and the potential for the fruit or seeds to spoil and negatively impact their flavour. When a ripe pod is picked, its still bioactive even after being removed from the tree. This means that some cells are still alive within the pod and will continue to interact and alter components within the pod. Understanding how to manage pod storage and use it for optimal flavour of the cacao is important to the farmers. The degradation of pods stored up to a week didn’t appear to negatively impact the flavour of the cacao, nor result in a high level of mouldy seeds (not any more than is considered within safe range). Hinneh et al. (2018) focused their work on pod storage in Ghana, and what impact it has on the cacao seeds at the molecular level. Ghana is the second largest producer of cacao in the world, and the majority of the country practises pod storage. Cacao pods are harvested at two major times during the year, but trees produce pods all year long. Each pod needs to be hand picked and opened by hand as well, one by one. It’s a very time consuming practise that has yet to be mechanized. According to Duncan (1984) farmers in Ghana have used pod storage to help with efficiency on the farm. They would gather enough pods and store them until they could organize family and friends to help open the pods. During pod storage, pods go from bright yellow on the outside with bright white fruit on the inside, to darkened and black on the outside and beige to brown on the inside. You can also see how much the fruit segments have shrunk, suggesting water evaporation from the fruit even while the pods are intact. Hinneh et al. states that there are microorganisms at work which breakdown the pods and the fruit, but which specific microorganisms are doing the work requires more research. Wills et al. (1998) and Aroyeum et al. (2006) state that the cocoa pod remains a living system after harvest, and here we can visualize some of the changes that occur over the span of a week. In short, the pod storage did not have much of an impact on the Fermentation Index (FI) or cut tests. The cut test looks at the number of slaty, deep purple, brown, germinated, mouldy, and flat beans. Between the 0 PS, 3 PS, and 7 PS, the bean cut test didn’t show any significant difference worth mentioning. The FI is a more objective tool to estimate quality of cocoa beans. Well fermented beans are suggested to have an FI greater than 1, and in this study FI ranged from 1.04-1.22. There was a relationship between the cut test and the FI values. Pods opened on day of harvest recorded the highest FI and percentage of brown beans, while pods opened on day 3 had a significantly lower FI than both 0 PS and 7 PS. As the degradation of the pod continued from 3 PS to 7 PS, so did the FI. They suggested that the increase in FI may be a consequence of “fermentation-like” processes that occur as the pod breaks down. The acidification of the cacao seed is a crucial step to the chocolate process. It occurs during the process of fermentation, but as we see here it also occurs during pod storage. This acidification is important because it kills the seed before it’s allowed to germinate. Germination will use up reserves (sugars) in the seed which are necessary for future aroma development. Just as important, acidification also allows for enzymes to break down sugars and proteins in the seed which will later be used to form the chocolate flavour. The breakdown processes initiated by nib acidification, which normally occur during fermentation, appear to get a head start if the pods are stored for 7 days prior to fermentation. Here, nib acidity began at pH of 5.52 at 0 PS, went down by day 3 and then became more acidic again by day 7. Seeds from pods opened on day 3 were lower in acidity (pH 5.61) than the ones opened on the day they were harvested. These 3 PS pods had a low pulp volume as well. Low pulp volume may allow for an increase in aeration and result in a reduction in the production of ethanol, which limits the production of acetic acid, and results in less acidic seeds. Nibs from pods opened on day 7 had the highest acidity (pH 5.45). It is suggested that as the pulp broke down after day 3, more ethanol was produced, which resulted in more acetic acid production. It’s known that during fermentation, constituents from around the whole cocoa bean can be transferred into the seed. Therefore, the seeds held in a pod for 7 days are sitting in a pool of juice high in acetic acid. That acetic acid may get absorbed into the nib via a small opening termed the micropyle (an opening in the seed from which the sperm enters), and lead to higher acidity within the kernel of the seed. The 3 sugars analyzed in the cacao seeds were sucrose, and its two reducing sugars: glucose and fructose. Pod storage does have an impact on sugar degradation. Overall, glucose decreased, sucrose increased somewhat, and fructose increased significantly. Fermentation is known to break down sucrose into glucose and fructose, both of which will be utilized during roasting to form the aromas of the cocoa bean. It appears that longer duration of pod storage also encourages the breakdown of sucrose into these reducing sugars. The significantly higher levels of fructose in 7 PS could be due to fermentation-like processes that occur inside the intact pod, confirming that pod storage appears to give a head start to fermentation. It appears that the acidification of the seeds encourage this break down of sugars. The fructose-glucose ratios for 0 PS, 3 PS, and 7 PS were 3:1, 2:1, 4:1. As the mass inside the pod becomes more acidic, sucrose in the seed is hydrolyzed (broken down) into fructose and glucose. However, we see that overall, sucrose in the seed increased. How could this be if it is also being broken down? It’s been suggested that although sugars within the seed breakdown, sugars within the surrounding fruit break down as well, and over time, become absorbed into the seed via the micropyle. It’s been documented that aromas and other constituents from the pulp enter the seed during fermentation, and it appears to also occur during pod storage as well. Just as important as it is for sugar to breakdown, the degradation of proteins into amino acids is also necessary if one wants the cocoa beans to taste like cocoa. Here, the seeds from pods opened on harvest day or day 3 do not show much of an increase in amino acid levels. However, the seeds from pods opened on day 7 have a significant increase in amino acids. It’s suggested that as the duration of storage increases, the pod breaks down at the cellular level, and the amino acids are released via proteolysis. Therefore, it appears extended pod storage seems to have a similar impact as fermentation does on the production of these amino acids. Many of the amino acids listed here were also discovered in other studies, except for citrulline and ornithine. Both of these amino acids have not yet been reported (to the best of their knowledge) by other researchers to date. According to Kerler, et al. (1997) these amino acids are precursors to 2-acetyl-1-pyrroline, and aroma molecule found in foods such as popcorn, roasted sesame, as well as jasmine rice, and pandan. Acidification, sugars, and amino acids may seem unimportant to you, but they are crucial to the aroma development of cocoa beans. The researchers wanted to know if pod storage could be use to develop improved and interesting flavours in cocoa. So what happens with these reducing sugars and amino acids? During fermentation and extended pod storage, sugars and proteins break down into reducing sugars and amino acids. When these seeds are roasted, these two components marry through multiple reactions at the molecular level, and form aroma molecules. These aroma molecules will contribute to the overall flavour of the cocoa beans, and to the flavour of the chocolate as well. Therefore, what leads up to their formation (as discussed earlier) is important to the flavour of your chocolate! We observed that by day 7 of pod storage, there was an increase in reducing sugars and amino acids, the building blocks of aroma molecules. This correlates with more aroma molecules identified in the seeds from pods stored for 7 days. The more reducing sugars and amino acids produced, the more they were available for the formation of the aroma molecules when the seeds were roasted. Here you can see the concentration and types of aroma molecules in the seeds grouped according to length of storage. On the far right you see a heavier concentration around pods stored for 7 days. The following is a list of the major categories of aromas identified and the corresponding aromas we attribute to them. Aldehydes contribute a great deal to “good cocoa flavor” states the paper. The decrease in aldehydes from 0 PS to 7 PS mirror the increase in pyrazines, likely due to the aldehydes being converted into the pyrazines. Almond, Banana, Bitter, Butter, Cream, Fermented, Floral, Fruity, Must, Sweet. Caramel, Chocolate, Cocoa, Green, Nutty, Peanut, Roasted, Roasted Nuts, Rum, Sweet. Pyrazines increased about 4 folds by pods opened on day 7. They suggested that aldehydes contributed to the formation of the many pyrazines here. Buttery, Burnt, Burnt Pineapple, Caramel, Fruity caramel, Roasted, Sweet. According to Miralles-Garcia (2008), these aroma molecules, mostly associated with "caramel”, are often formed by the caramelisation of sugars, but can also be formed through Maillard reaction pathways as well, which only occurs during roasting cacao at high temperatures. Almond, Cabbage, Chocolate, Cocoa, Gasoline, Hazelnut, Nutty, Roasted, Smoky, Sulfur. What can we take from this research? We have evidence that pod storage initiates the processes that allow for future development of aromas within the cacao seed. However, it appears that pods stored for 7 days had benefited the most from pod storage, and storing pods for only 3 days didn’t appear to really have much of a positive impact on final cacao flavour. This offers hope for farmers who are growing what is considered “bulk cacao” as it may allow them to improve the flavour quality to a degree. Improving the flavour will potentially allow them to sell their cacao for more. As well, as chocolate makers begin to market specific practises to get your attention, understanding the impact of pod storage may help you as a consumer to make smarter choices and ask these makers the right questions to have a better idea of what they are selling you. Michael Hinneh, one of the main researchers from this project, will be speaking about his work on pod storage at TEDx in Ghent on December 8, 2018. Be sure to check him out on instagram and watch his TED talk when it becomes available online. Newer PostCacao type impacts fermentation, which impacts chocolate quality. Older PostRoasting conditions & polyphenol levels in cocoa beans.